Canine cancer has become prevalent in recent years. Almost like an epidemic! Preventing cancer in dogs before the disease rears its ugly head is so important. This post suggests ten useful tips to reduce risk of cancer in dogs. According to the Animal Cancer Foundation, there are about 65 million dogs in the United States, and among these dogs, about 6 million new canine cancer cases are diagnosed each year. And, according to The Veterinary Cancer Society, cancer is the leading cause of death in 47% of dogs, especially those over the age of 10. 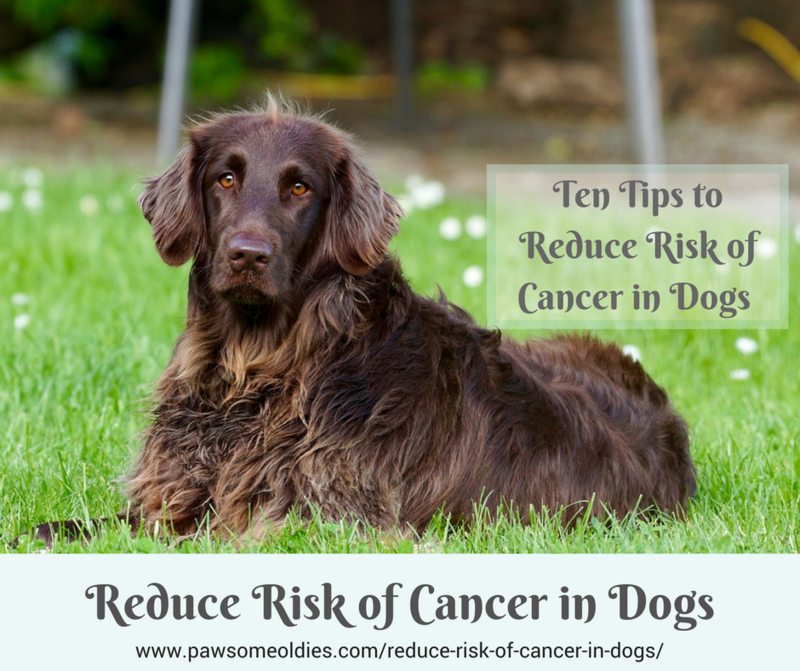 So, as dog parents, what can we do to help reduce risk of cancer in dogs, especially in older dogs who are more prone to development of cancer? Chronic inflammation can cause cell damage, and over time, damaged cells could turn into cancerous cells. The first thing you can do to minimize cancer in your dog is to feed him an anti-inflammatory diet that consists of whole foods that are of high-quality. Cancer cells need simple sugars (e.g. glucose) for energy and growth. On the other hand, they cannot use fats for energy. So, a good anti-cancer diet should contain animal proteins, such as muscle meat from chicken and turkey, ground beef, fatty fish such as salmon, etc., organ meat (such as chicken heart, liver), good fat with anti-inflammatory properties such as Omega-3 fatty acids (salmon oil, krill oil), and a bit of healthy veggies and fruits. What kind of veggies and fruits are considered good and healthy for dogs? For the purpose of cancer prevention, include those that are rich in “phytochemicals”. The so-called “superfoods”. Phytochemicals are organic compounds found in plants. They have the ability to work at a cellular level to prevent and fight disease. For example, some phytochemicals help body cells to get rid of toxins and carcinogens, while other phytochemicals support cell functions and boost the immune system. Other foods rich in phytochemicals include seeds and nuts (e.g. pumpkin seeds, chia seeds, flaxseeds, almonds), as well as some herbs such as parsley, oregano, basil, thyme, turmeric. In addition to superfoods that contain phytochemicals, cultured dairy products are also great cancer preventing additions to your dog’s diet. These foods are rich in probiotics – a source of the “friendly bacteria” that colonize the digestive tract and balance the gut flora. They are important as they help support immunity. Consider giving unsweetened probiotic yogurt or kefir to your old dog. Low-fat cottage cheese is also a healthy addition to your old dog’s diet. Fatty fish such as salmon can also be anti-cancerous because of their high levels of Omega-3 fatty acids, which are anti-inflammatory and anti-oxidative. While it is important to feed healthy foods to your dog, it is equally, if not more, important to avoid feeding the dog unhealthy foods that are potentially cancer-inducing! Seems like a small thing but pure (chemical-free) clean drinking water is so essential in helping reduce cancer in dogs. Clean water helps flush out toxins from the body. But if the dog drinks chemical-laden water, that not only defeats the purpose, but worst of all, chemicals in the water get accumulated in the dog’s body and can cause cancer down the road! Tap water cannot be considered “pure” and “clean”. A study by the Environmental Working Group found 316 chemicals (such as arsenic, fluoride, lead) in tap water throughout the United States! So what can you do? A simple solution is to get a water filter like a reverse osmosis filtration system , which works the best because this type of filter traps any molecule bigger than water, and so is effective in eliminating both impurity and chemicals from the water. Another important way to help reduce risk of cancer in dogs is to eliminate or at least minimize exposing dogs to toxins. You will be surprised to find that there are toxins everywhere in the environment! For example, toxins can be found in products such as lawn sprays, pesticides (e.g. flea and tick preventives), cigarette smoke, chemical-laden household cleaners, etc. A study in 2012 found that the use of professionally applied lawn-care pesticides could result in a whopping 70% higher risk of dogs getting malignant lymphoma. Another study by Purdue University found that dogs exposed to herbicide-treated lawns were seven times more likely to develop transitional cell carcinoma (TCC), which is a form of bladder cancer. Dogs using flea preventives that contain the chemical fipronil (e.g. Frontline®) may have a higher risk of thyroid cancer. Fipronil has been found to cause thyroid tumors in rats and is classified as a carcinogen for humans by EPA. There are also quite a few anecdotal reports by dog parents that their dogs developed thyroid cancer after using Frontline for a few years. Even if you try hard to shield your dog from toxic exposure on a day-to-day basis, it’s going to be difficult to avoid all toxins. So be sure to detoxify your dog regularly. There are herbs and supplements that can do a good job detoxifying your dog. Please take a look at my article on Dog Detox for suggestions. You may have heard stories of dogs getting sick from over-vaccination. Granted, some vaccines against diseases such as distemper and parvovirus are necessary, while some may be required by law (e.g. rabies). But there are a lot of other vaccines that, depending on where you live and your dog’s lifestyle, may not be necessary at all. Over-vaccination results in an overly stimulated (and unbalanced) immune system. Since having a strong immune system is essential in fighting off diseases such as cancer, don’t risk getting your dog’s immune system off-balance by over-vaccination. the specific virus poses a health risk to your dog. Research shows that obesity is a risk factor of dogs (and people) developing cancer. Another study shows that calorie restriction at an early age may decrease formation of tumors later in a dog’s life. Obesity in itself is unhealthy, so it makes a lot of sense to keep your old dog slim! One way to keep your pawsome oldie lean and healthy is encouraging him to exercise regularly. Another reason for your dog to have regular exercise is that exercise can help improve blood and lymph circulation. As you know, the lymphatic system is one of the most important defense mechanisms in the body. So it is essential to keep the dog’s lymphatic system healthy and well-circulated for cancer prevention. How can sleep reduce risk of cancer in dogs? You may ask. In fact, having enough sleep is important to help reduce risk of cancer in dogs AND in people. In people, there are studies that show a direct link between insufficient sleep and breast cancer in post-menopausal women, and between chronic sleep disorders and prostate cancer in older men. While there are no similar studies on dogs, we do know that sleep strengthens the immune system, and having a strong immune system can of course help fight disease and reduce risk of cancer in dogs. Another reason why sleep is so important for canine cancer prevention is melatonin production. Melatonin is a hormone that is closely linked to healthy immune function. And the thing is, for the body to sufficiently produce melatonin, at least eight to nine hours of sleep is needed. Are your old dog’s food and water bowls made of plastic? If so, replace them with stainless steel ones. Compounds in plastic leach into water and wet food and become an endocrine disruptor, which messes with the dog’s hormone levels. Hormonal imbalance is a big risk of certain cancers, such as breast cancer, uterine cancer and prostate cancer. 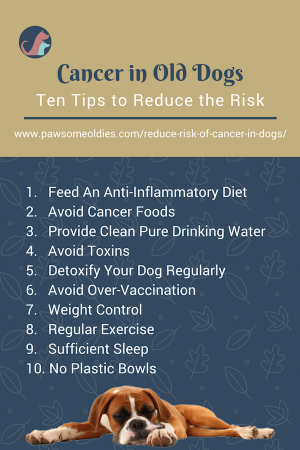 As you can see, there are quite a few things that dog parents can do to help reduce risk of cancer in dogs. The good news is, most of these things are not difficult to do, and if you do all of them, your old dog can live a much healthier, longer life.